Well – day 2 has come to an end. Crossing into Nevada we have gained an hour which is always nice. We have arrived at one of my favorite places to bunk down, the Silver Jack Inn & LectroLux Cafe – decorated in the best vacume cleaners turned space ships that you will ever see. 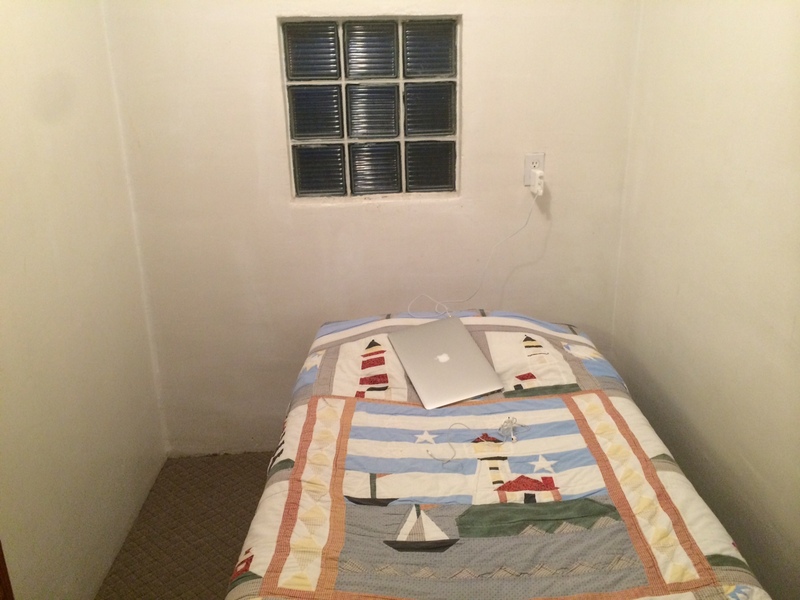 I am writing you from my perfectly accomodating 8 x12 room. Complete with glass block. 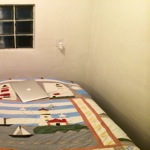 I would go so far as to call it prison room sheik, but the windows open, so it would not make a very good cell. In fact this a great room. Last time I stayed in one of the back trailer units. They were great too. I just love this place. For anyone who has ever vistited Baker, NV nestled near Great Basin National Park,you would know that there is not much here, other than peace and quiet. The Cafe offers up refreshments for the gentle pallete all the way up to an impressive list of top shelf items, beer and wine. Tonight courtesy of Jay, we dined on delicious pizza while planning out the rest of our West Coast Route. Tomorrow the goal is Yosemite. We will be getting an early start, since the days out here have been about 100 degrees. Of course it is pouring right now – but hopefully that will cool things off in the morning. – This post was delayed due to the storm knocking out our internet connection. It sat right on top of us – lightening lit everything up and the the thunder rocked our small cabin with a force that would make Angus Young proud! Apparently bringing flash floods into Utah, so we may have passed through at just the right time. Most likely no conectivity in Yosemite tonight. Yes, there is something to be said for being disconnected, but I think there is also something to be said for being able to travel and get work done from anywhere. Thank you thing called the internet, whoever you are! Better check your route through Yosimite. There’s a fire on the so. West side and Hwy 41 has been closed into Oakhurst. Hwy 120 should be open. If not the Sonora Pass is a great ride over the mountains. Worst case scenario would be Hwy 158 through Isabella. Just an Ok ride.